During the grueling, 26.2-mile New York City Marathon in November, MBA student Junau Boucard ’11 (BUS) will have plenty of time to think. And when he’s exhausted, depleted, discouraged, and his feet want to quit, his mind will take him back to last March when he visited Vietnam through a School of Business-organized immersion trip. While there, he developed a powerful connection with the people of his host country. He’s dedicating his marathon run, and any donations he raises because of it, to making a better life for some of that country’s youth. All of his earnings will be donated to Blue Dragon Children’s Foundation, which fights poverty, human trafficking, and other social issues. “While in Vietnam, I fell in love with the people, the food, and the culture,” says Boucard, who is earning his degree at UConn Stamford while working full-time at a financial software company, FactSet. When a representative of Blue Dragon, based in Hanoi, talked about the organization’s mission and how they are able to help children in crisis, Boucard was moved. Boucard was born in Haiti, and moved to the United States as a 7-year-old. Boucard has worked at FactSet for the past five years and is currently working in product development for the company. He has been in the part-time MBA program in Stamford for two years, taking classes year-round without a break, and expects to graduate in Spring 2019. “I hope to take my career to the next level at FactSet, or join a leadership rotational program at a Fortune 500 company,” he says. He particularly enjoys classes in management strategy, including learning from mistakes that prominent business leaders have made while trying to build great businesses, as well as leveraging data to solve business problems. He also excels in finance classes, working in diverse teams, and is intrigued by international business. 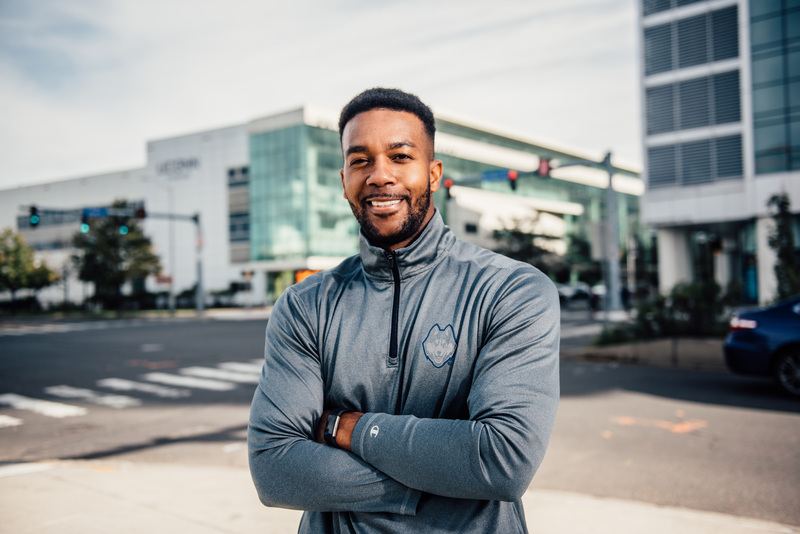 Upon completing his master’s, Boucard will be a two-time UConn alumnus, having completed his bachelor’s degree in business administration in 2011 at Stamford. The New York City marathon was a ‘bucket list’ challenge Boucard had considered for some time. Runners must qualify or enter a lottery to participate. He learned in late January that he had been selected as one of more than 50,000 runners to participate in the marathon on Nov. 4. The training hasn’t been easy to fit into his busy schedule, and he plans his longer runs for weekends. “I’ve always been fairly athletic, but I’m not a runner,” Boucard says. And at 200 pounds, he doesn’t have a classic runner’s body. But since he started training, he has lost about 15 pounds. He says that previously, he didn’t think he could run even a half-marathon without stopping. During the 10-day Vietnam trip, Boucard learned about emerging markets finance and supply chain management across the globe. He learned about the government, the currency, and the ties between countries within Southeast Asia. He and other graduate students visited Coca-Cola, Intel, the U.S. Embassy, and the Ho Chi Minh Stock Exchange. It’s a country that is growing rapidly, thanks to its well-educated populace and low labor costs. Yet the opportunity for immersion in Vietnamese culture also uncovered some of the problems associated with an emerging economy. It was “a true eye-opener to the group,” says OPIM professor Jan Stallaert. “The students were extremely moved by the stories of human trafficking as revealed by Blue Dragon.” The whole group is now supporting Bouchard in his marathon attempt. It was UConn program manager Marlys Rizzi who recommended using the marathon as a springboard to help Blue Dragon.